Powerful solution for Data Migration (hard drive clone, upgrading) and backup. DriveWizard? V1 makes upgrading to a new hard disk faster and easier than ever. 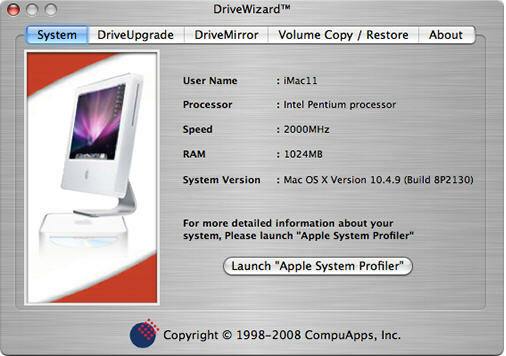 With DriveWizard you don't have to be a professional computer technician just to replace your old hard disk with a new high-capacity hard disk or save your data safely. There was a time when backup and upgrading to a new hard drive meant hours of downloading your data, applications, and operating systems to disk; then hours more of reinstalling everything to your new hard drive. Now it is just few minutes no need to do it for days. Connect both hard drives to your computer, and with a few simple steps, everything from your old hard drive is automatically copied to your new one without losing a single preference, setting, or byte of data. No re-installing, no data loss, no headaches. And unlike other hard drive upgrade solutions no additional cables are necessary! Universal Binary supporting both PPC and Intel processors. Clone hard drives using low-level RAW block reads/writes. Upgrade /Resize hard drives to higher or lower hard drive sizes. Restore/Volume copy to existing volumes. Bare Metal Restore for disaster recovery. CompuApps provides high-performance disk utilities for fast and safe system upgrading, backup, and recovery.